Vedic culture is extremely ancient, at least 5000 years old by conservative estimate. Vedic culture has its own unique theology, philosophy, arts, sciences, and literature which exists to this present day. 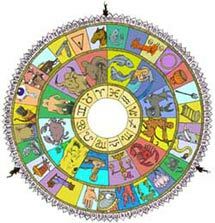 Vedic astrology is an integral part of this culture and has been practiced since time immemorial. The Vedas have six supplementary texts known as the Vedangas, limbs of the Vedas. One of these is the Jyotisha Vedanga, Vedic astronomy and astrology. For thousands of years many Rsis (sages) maintained the tradition of Vedic astrology on a parallel track with the Vedas. Portions of these have been extracted at various times and put into the Jyotisha Vedanga. Many Rsis such as Vashistha, Bhrgu, and Garga were masters of astrology and taught it to their disciples in the Guru parampara (disciplic succession). Before the beginning of the present age, Kali-yuga, which began in 3102 B. C., Parasara Rsi milked the essence of the various schools of Vedic astrology present at his time and distilled it into his text known as the Brhad Parasara Hora Sastra. Parasara Rsi spoke this text to his disciple Maitreya Rsi, and Maitreya taught it to his disciple and it was passed in this way through the ages. Thus, the basic school of Vedic astrology practiced in India is called the Parasara school of astrology. Parasara was the last of the Rsis (great sages) of the Vedic age. After him it was humans who preserved the line of Vedic astrology. Notable amongst them is Satyacarya and in particular Varaha Mihira who wrote several important texts on astrology. After them several other texts were composed which are also considered "classics" of Vedic astrology, such as Jataka Parijata, Sarvartha Cintamani, and Horasara. All of these texts follow Parasara. Since the great classics follow Parasara it is natural that the curriculum of the Florida Vedic College faculty of Vedic Astrology also follows Parasara. It should be said that there are six main branches of Vedic astrology: Gola -- positional astronomy, Ganita -- mathematical diagnostic tools for analyzing the results of Gola, Jataka -- natal astrology, Prasna -- answering specific questions based upon the time the question is asked (this is called horary astrology in the West), Muhurta -- selecting an auspicious time to start something, and Nimitta -- omens and portents. There are also many sub-branches. The sages following Parasara have written texts on all branches. These shall be the guidelines for our courses. We are presenting pure Vedic astrology without mixing in Western or any other type of astrology systems. From India Vedic astrology spread to the Persians, and from the Persians to the Babylonians, and from them to the Greeks, Romans, and Egyptians. With the rise of Islam, the Arabs learned astrology from both the Greek Hellenistic astrologers on one side (the West) and Vedic astrology from India on the other side (the East). In the West astrology has had its difficulties. Periods of time when it was it in favor, and times when it was politically out of favor. During the Dark Ages it practically disappeared from Europe and reappeared during the Renaissance. It disappeared during the so-called "Age of Reason" only to reappear again in the last 120 or so years. This fractured history of Western astrology has not helped the continuity of learning or building up of experience over the ages. Consequently Western astrology is fraught with many lacunae; blank spots, missing parts, and discontinuities. By contrast, Vedic astrology has an unbroken tradition over 5000 years long. And its practitioners reap the benefits of such a long unbroken tradition such as a large body of classical literature whose content is understood by its practitioners. In ancient India and even up to modern times, astrology was taught to students in schools and universities. The Florida Vedic College carries on this tradition of offering Vedic astrology as a serious intellectual discipline taught at a university level. These are serious courses for serious students. This is the first time since the 16th century that degrees in astrology have been offered in a Western institution of higher learning. And this is the first time ever that an institution of higher learning outside of India has offered degree courses in Vedic astrology.